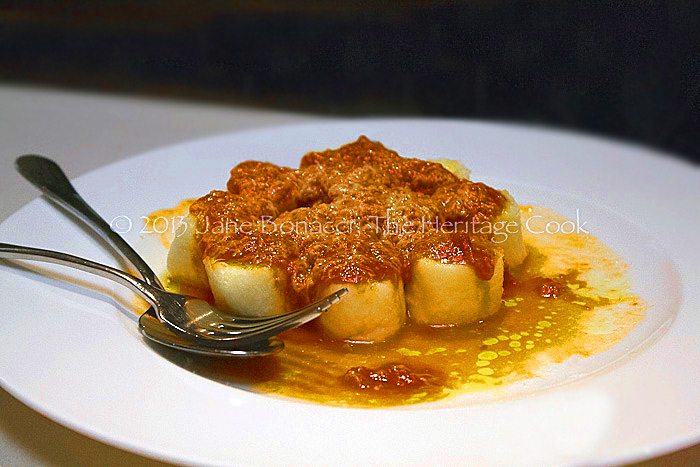 Chef Chiarello’s Ricotta Gnocchi – pillows of dough in an incredibly rich tomato sauce … Heaven! The day dawned with the cool San Francisco fog quietly blanketing the City, draping itself over the Golden Gate Bridge as we began our drive North to Wine Country. As we wound through the city streets, my friends who were in town for the International Association of Culinary Professionals (IACP) conference chatted animatedly. It had been a year since the last conference and we were excited to get caught up. The Golden Gate Bridge emerging from the fog. Each year the conference is held in a different city and this time it was in San Francisco. I was thrilled to have a chance to show my friends my favorite places and give them a taste of what my life is like. I recognize how lucky I am to be from this beautiful place where people from all over the world dream of visiting. It is worth the cost to us. We don’t have an enormous home with acres of land, but we have the Golden Gate Bridge in our backyard and Napa just up the road. Life is good! Lady Rose and her Tipsy Tarts! When we discovered that the conference was going to be in San Francisco, I offered my friends the option to come in a day early and tour some of my favorite restaurants and wineries in Napa Valley. I never pass up an opportunity to spend time in the area where The Artist and I dream of living one day! The fog began to burn off as we drove north, revealing the beautiful scenery as we drove through the Carneros region, crossing south of Sonoma and Napa Valleys. Each appellation (micro wine growing region) not only has different soil compositions that alter the flavors of the wines, but the terrain has subtle variations lending each area its own individuality. We began our day at Bouchon Bakery, picking up items that we could snack on that day and during the following week. As always, the Bouchon team had an impressive selection of beautiful baked goods that had us drooling immediately. Bags in hand, we wandered across the street for our special wine tasting at Bottega. As we approached the restaurant, who walks out but Chef Michael Chiarello! I caught his attention and explained that my friends and I were having a tasting and then lunch at the restaurant. Incredibly gracious despite his obvious need to get to his office, he introduced himself and shook their hands, then went on to his his business meetings. There was a moment of stunned silence as I explained whom they had just met. Wow! Brandon St. Martin – wine instructor extraordinaire! We then met Brandon St. Martin, Bottega’s head of winery relations and a great guy. He immediately had the gals swooning with his good looks, natural southern charm, and sense of humor. He gave us an overview of the history of winemaking in the Napa Valley, explaining about the challenges early vintners faced, and brought us to the point where Chef Chiarello made the decision to add the title of winegrower to his impressive resume. Then we headed to the terrazzo directly adjacent to the restaurant and settled in for some more lessons on the fine art of wine tasting. Oh My, what an experience! We couldn’t have asked for a better tutor than Brandon. Bright and intelligent with a thorough knowledge of winemaking, he was able to answer all of our questions, anticipating most of them before we even knew we wanted the answers! We were treated to a wide array of the Chiarello Family Vineyards wines, starting with their Chiara Bianco and Chiara Rose, light wines that are served chilled and would be perfect on hot summer afternoons. The colors were stunning and I have a new respect for Ribolla and Zinfandel Rosé! Next we moved on to sample the wines from the vineyards named for members of Chef Michael’s family: Giana Zinfandel, Felicia Zinfandel, Roux Petite Sirah, Bambino Cabernet Sauvignon, and their flagship wine, Eileen Cabernet Sauvignon. Every wine was incredible, each with their own characteristics and pairing possibilities. Our minds were swimming with possibilities and dreams of what we would make to complement each wine. Setting up for the next round of tasting! With total production limited to 1500 to 2500 cases annually, this was a real treat for my friends who do not live in the area. These are not wines that are easy to find, but thankfully are available for purchase online! We took our wines inside and settled down for a luscious Italian lunch interwoven with the rustic graciousness of Italy with the nuances of California cuisine. We shared the pesce crudo served on a Himalayan salt block, wood-grilled octopus with olive oil potatoes, pickled red onions, and salsa verde, ricotta gnocchi “pillows” with old hen salsa di pomodoro and pecorino, and duck three ways (roasted breast, confit leg, duck liver mousse) with Sierra Beauty apple passata, spiced hazelnuts and watercress. I was given permission to take my camera into the kitchen and capture some of the frenetic action that goes on during service. It is an elegant ballet with the chefs moving quickly and gracefully along the line, completing their tasks with skill! While we were eating, Michael’s wife Eileen stopped by the table and introduced herself. Just as delightful as her husband, Eileen graciously shared her time with us. It was an honor to meet so many of the people who make Bottega the success it is. When we left, each of us felt as though we were the most special people in the restaurant – the mark of a very talented team of professionals! The next time you have the chance to visit Napa Valley, I encourage you to set up a wine tasting and meal at Bottega. Send Brandon an email (brandon@chiarellowvineyards.com) and he will take care of all the arrangements. And if you fall in love with the wines as I expect you will, you can join the Chiarello Family Vineyards Club Simpatico and enjoy the benefits of VIP status, invitations to events at Michael Chiarello’s restaurants, first access to reserve and library wines, member pricing to all premium events, included wine shipping (restrictions apply), complimentary tastings/tours, etc. It’s a shame Rose never has any fun! Michael and Eileen and their team have perfected the art of hospitality and practice the concept of simpatico, which in Italian means pleasant, likeable, friends, and kindred spirits. I know you will leave part of your heart with them at Bottega! These gnocchi have just four ingredients: ricotta, flour, egg yolks, and salt. Use a very good ricotta, such as Bellwether Farms’ sheep’s milk ricotta. This gnocchi needs a 48-hour lead-time because you’ll let the ricotta drain overnight the day before you make the gnocchi and then you’ll freeze the gnocchi for 24 hours before cooking. Drain the ricotta by lining a colander with cheesecloth and setting it in the sink. My mom used to make a little sling out of the cheesecloth and hang it from the kitchen sink. When you are ready to make the gnocchi, you want your work surface to be cool. Marble is ideal - a marble pastry slab or countertop is best. If you don’t have marble, try laying a few ice packs on the countertop while you make the dough. When you’re ready to roll, put the ice back in the freezer and wipe down the work surface so it’s dry. Make Gnocchi: Using the back of a large spoon, press the drained ricotta through a fine-mesh sieve into a large bowl. Add the egg yolks and sea salt and mix with a rubber spatula. Gently fold in the 3/4 cup flour; the less you work the dough, the lighter and more tender the gnocchi will be. (Note: if you are using gluten-free flours, you do not have to worry about over-working the dough and developing gluten.) Cover and refrigerate for 30 minutes. Lightly sprinkle your work surface and two baking sheets with flour. Pull off about a quarter of the gnocchi dough and gently roll it into a rope about 1-inch wide. Prepare Gnocchi: Heat a large pot of salted water (see note below) and while the water heats, put the sauce on the stove over a simmering flame so it’s warm when the gnocchi are cooked. When the water comes to a boil, cook 2-dozen frozen gnocchi for 3 to 3-1/2 minutes, or for 30 to 45 seconds after they rise to the surface. Using a slotted spoon or a wire skimmer, transfer the gnocchi to a warmed plate. Add another 2-dozen gnocchi to the pot and, while they cook, finish plating the batch of gnocchi you just took out of the pot. To Plate: Spoon about a dozen gnocchi per serving onto a warmed plate. Drizzle with olive oil. Spoon a little of the warm tomato sauce on top and finish with a sprinkling of pecorino. Yield: 6 to 8 main course servings, about 72 to 84 gnocchi. The Italians have a saying: “The pasta water is salted enough when it tastes like the sea.” If you can’t taste the salt in the water, you haven’t used enough. The basic rule is 1 tbsp of kosher or sea salt for every 1 quart of water. Always reserve a bit of pasta water. If your pasta seems dry, spoon on a little pasta water and toss just before serving. My mom made this sauce often for gnocchi, and whenever she did, she would pull the hen out of the sauce at the last minute, keep it warm, and then serve it as a the secondi, or second course, with fresh-chopped parsley and a little basil. I suggest you try this, too. You will not need all 4 cups if you are making gnocchi. Freeze whatever is left for a future meal. Preheat the oven to 300°F. Heat a large Dutch oven over medium-high heat and add the oil. Season the chicken with salt and pepper. Add the chicken to the pot and lightly brown on all sides. Place the Dutch oven over medium-high heat and sauté the carrot, celery, onion, and garlic until tender, about 8 minutes. Add the rosemary, bay leaf, and red wine. Stir to scrape up the browned bits, then return the chicken to the pot. Cook to reduce the wine until the pot is almost dry. Pour in the milled tomatoes and season the sauce with salt and pepper. Make a sweating lid to fit the pot (see Chef’s Notes below). When the parchment seating lid is in place and resting on top of the chicken, slide the pot into the oven and cook for about 1 hour, or until the chicken is cooked through. You can use a regular pan lid if you don’t want to cut a sweating lid from parchment, but allow a little more cooking time. Using tongs, transfer the chicken pieces to a plate. You can keep the chicken warm and serve it as a second course, or let it cool, wrap, and refrigerate for another ruse. Add the torn basil leaves to the sauce and use this in place of any marinara sauce. Tomatoes put through a food mill have the right consistency for the sauces I make. If you don’t have a food mill, you could pulse tomatoes just 3 or 4 times in a food processor (don’t overprocess them), but to get the same velvety consistency of the sauces we serve at Bottega, a food mill works much better, and is an inexpensive addition to your kitchen tool set. Cooking under a sweating lid reduces the circulation of the air in the pot and, by holding in the steam, keeps the food moister. There are two ways to cut a sweating lid: Trace the lid for the pot you’ll be using on parchment paper and then cut the paper a little smaller, so the parchment fits inside the pot. The other way to make a sweating lid - the chef’s way - is to tear off a piece of parchment larger than the pot. Holding one point of the parchment sheet toward you, fold the parchment into a fan, starting at the left side and folding back and forth to create accordion pleats. Hold the parchment fan over the pot with the tip of it dead center, and then use kitchen shears to snip off the fat end of the curve. The sweating lid will fit down inside the pot and sit right on top of the bird as it cooks, keeping it moist and flavorful. Our Canadian mascot for the week … he’s quite a lush! « Duck Fat Fries – a Kid’s Favorite Snack!